January | 2015 | MICROBIOLOGY MATTERS ! I’ve been doing some reading lately, mainly on the subject of World War I and it naturally brings to mind topics for this website ….. this time “lice”. Why are we not able to eradicate parasites such as lice? Surely if the little blighters do not have a host to live off then they die therefore minus the hosts and we shouldn’t have issues of lice, yes? The head louse ( Pediculus humanus capitis) is essentially a harmless pest. It is a wingless insect which spends its entire life on the head of a host feeding off small amounts of blood. They cannot fly or jump and do not transmit disease although they can be responsible for secondary infections of the skin due to scratching. They are simply a nuisance and one that should be able to be eliminated from our society. Body lice (Pediculus humanus corporis and sometimes Pediculus humanus humanus), common during the Great War, are far more dangerous due to their potential to transmit diseases such as typhus and trench fever. The two species are physically very similar, almost indistinguishable, but do not interbreed however they have been known to under laboratory conditions. Again a parasitic pest that should be able to be eliminated with adequate hygiene practises. If the world can eradicate smallpox (Variola virus – declared obsolete by the WHO in 1979) then why can we not do the same with our Pediculus friends? Just as we needed the “buy in” of people to get vaccinated against smallpox we should be able to get their “buy in” to de-louse. Why do we bother taking conjunctival swabs? Is it for therapeutic reasons? The patient may expect this investigation. The clinician may be acting out of habit or seeking to reassure the patient that he is doing a professional job. Is it to change management? 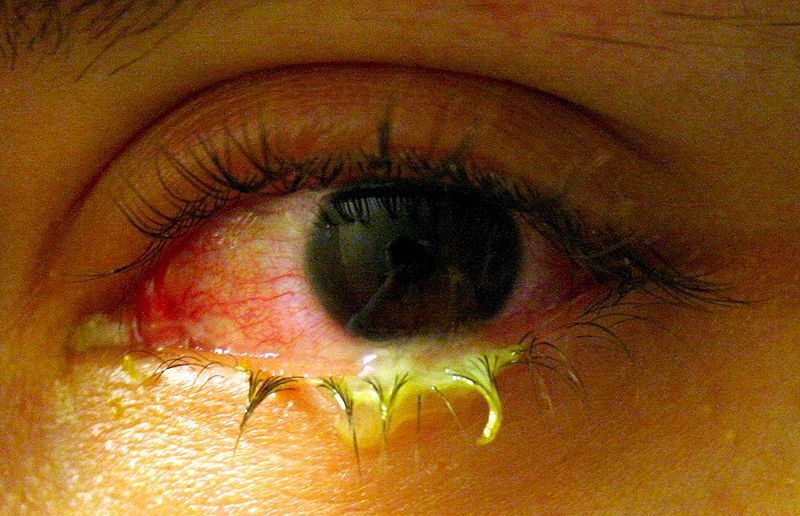 The standard therapy for bacterial conjunctivitis in New Zealand and Australia is Chloramphenicol drops/ointment. It is a good broad spectrum antibiotic with excellent coverage against the normal pathogens of bacterial conjunctivitis. (Staph aureus, Streptococcus pneumoniae, Haemophilus influenzae, Moraxella catarrhalis). Failure of this therapy is usually due to poor compliance, not given frequently enough, lack of associated eye cleansing, re-infection etc.. It is almost never due to lack of in-vitro susceptibility of the pathogen to the chloramphenicol. Low resistance rates are probably due to the fact that chloramphenicol is rarely used as asystemic antibiotic nowadays because of the risk of marrow aplasia. In summary I think there are a whole heap of conjunctival swabs taken which frankly do not need to be. For example if your laboratory receives on average of 12 conjunctival swabs a day costing approx $20 each to process. If 10 swabs are not appropriate then that is $200 a day times 365= $70,000 a year. The cost of unnecessary testing is not insignificant…. Clinical/epidemiological suspicion of gonorrheal or chlamydial conjunctivitis. Associated cellulitis of the skin around the eye. Condition not resolving after regular eye cleansing and empirical topical antibiotic therapy given at sufficient frequency and for sufficient duration. It is time for the lab to stand up and say that these are the patients that we really want conjunctival swabs from, so we can focus our time, money and efforts, and make a genuine difference to the patient….